Growing up in India, my knowledge of other cuisines (other than Indian of course) was very limited. 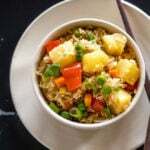 I only knew about indian veggies, breads, rice and lentils. When we grew up a little, things changed and suddenly pizzas, pastas and manchurian were everywhere. I know things have changed a lot now but back then the only food that we ate which was not “Indian” were burgers, pizzas, pasta, noodles and indo-chinese. 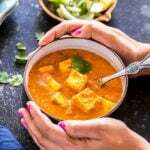 We had little or no idea about any other food in the world and so when I moved to US I was suddenly exposed to a lot of cuisines, some of which I have grown to love. Mexican and middle eastern food are two of my top favorites. And it is my love for these cuisines that keeps inspiring me to try out these recipes, the latest being pita bread. 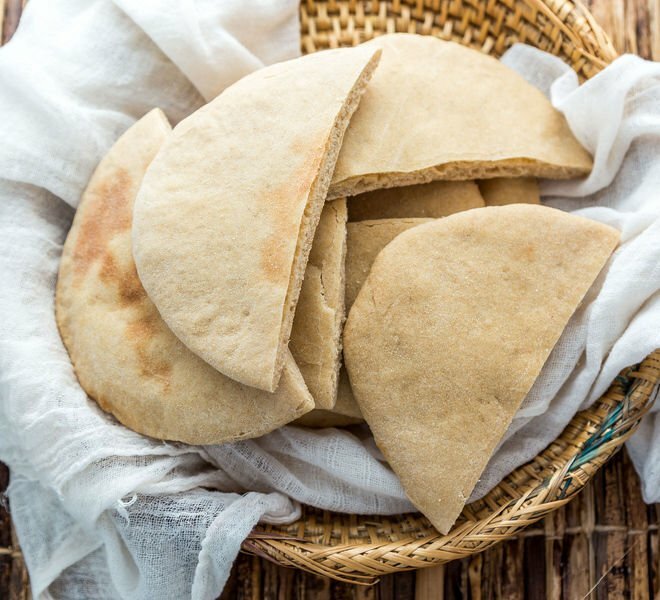 Pita breads are an integral part of Afghan, Lebanese, Persian cuisines, just like parathas and naans are for us. These flat-breads are made from all purpose flour and puff up in the oven when baked. 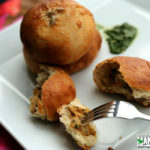 Because they puff up, these breads have pockets in them called “pita pockets”. The bread collapses after being taken out of the oven but the pocket can be used to fill in a lot of stuff, which makes for some super awesome pita pocket sandwiches. 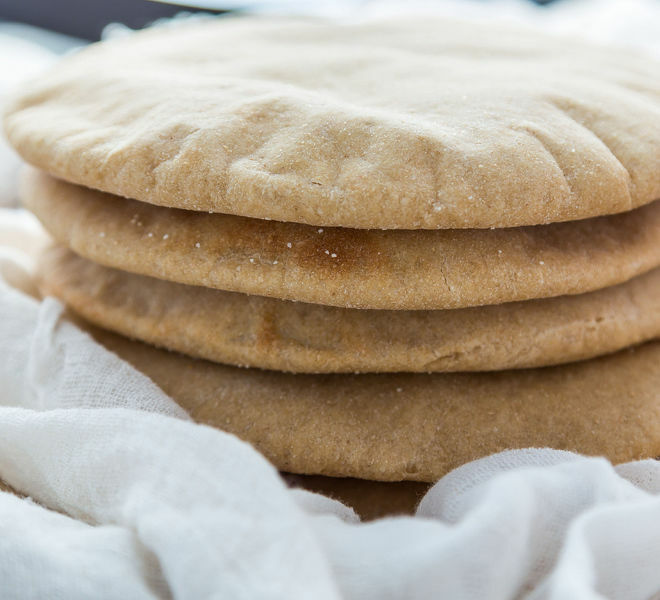 When I decided to bake pita bread at home, my first thought was I am going to make these healthier. After all what’s the whole point of baking breads at home? 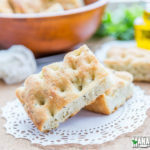 It’s fine to make the traditional recipe once in a while but if you bake breads regularly then you gotta look for healthy alternatives. So I used 100% whole wheat flour, our regular atta that we get from Indian store for making these pita breads. 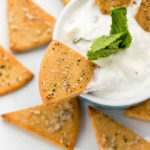 They were soft, light and tasted great, I did not miss eating the regular pita bread at all! 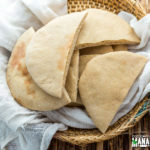 Pita bread is pretty easy to make, I used my oven but you can make this on your stove top too. You can put it directly on gas, like we do with phulkas and the pita bread would puff up. In a bowl whisk together whole wheat flour and salt. Add in the olive oil and mix till it’s well combined with the flour. Take warm water in a glass/mug, add sugar and yeast and give a quick stir. Please make sure that the water is warm, not hot and not cold. If it’s cold the yeast won’t activate and if it’s too hot it will kill the yeast. So it has to be warm, if you have a candy thermometer (which you must have if you bake breads regularly at home) check the temperature it should be between 110-115 F degrees. Let the mixture sit for 5-10 minutes. After 10 minutes, the yeast will get activated and you will see froth/bubbles on top (see picture). If you don’t see any frothing, that means your yeast didn’t get activated and so you have to discard the liquid and start again. Add the liquid to the flour mixture slowly, in parts. Knead the entire liquid into the flour forming a dough. The dough will be little sticky. Sprinkle some flour on your working surface and knead the dough for 2-3 minutes till it’s smooth. Place the dough in a large bowl coated with olive oil. Make sure the entire dough is coated with oil. Apply a cling sheet over the bowl and let the dough rise for 1-1.5 hours. After 1 hour my dough more than doubled in size because it was quite warm the day I made this bread. If it’s cold where you live this might take little longer. 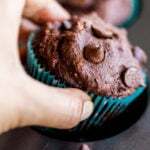 In case it’s really cold the day you bake this here’s what you can do > preheat oven to 180 F degrees, switch it off and then place the bowl inside. Punch the dough to release all the air. Let the dough sit for 5 minutes. Divide into 6 equal portions and let the dough sit for another 10 minutes. After 10 minutes, roll each dough ball into a round flat bread, around 8 inch and 1/4 inch thick. The bread should be little thick, don’t try to roll it thin like chapati/roti. Sprinkle some cornmeal on a baking sheet and place the rolled pita breads over. Let them rest for 15 minutes, cover them loosely and in the meanwhile preheat your oven to 475 F degrees. Place the baking tray in the preheated oven and bake at 475 F degrees for 7-8 minutes. The pita bread is done when they puff up. 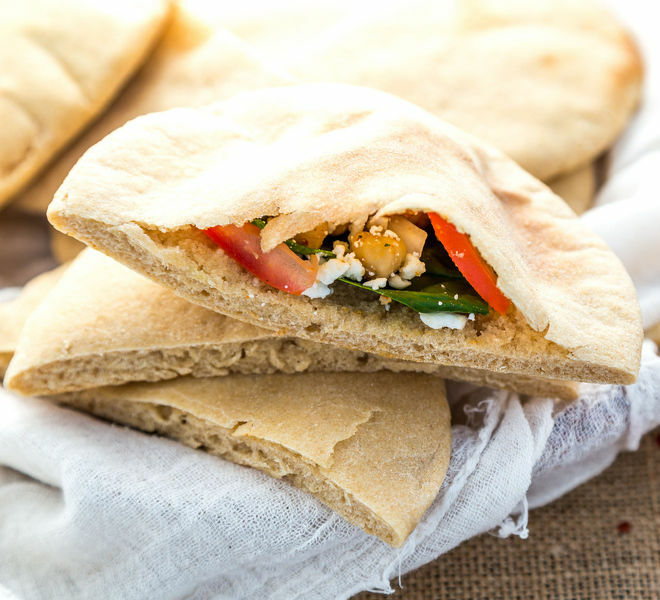 Take them out of the oven and serve warm pita bread with veggies, dips or make a pita pocket sandwich like this! * If you use all purpose flour for this recipe, you might need to use little less water. Also the pita breads would be done in like 3-4 minutes. * You can freeze pita breads after they cool down. 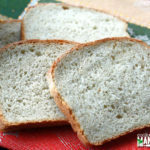 Place a parchment paper between each bread and then pack the entire stack in a freezer bag. They should stay good for around 2 months. 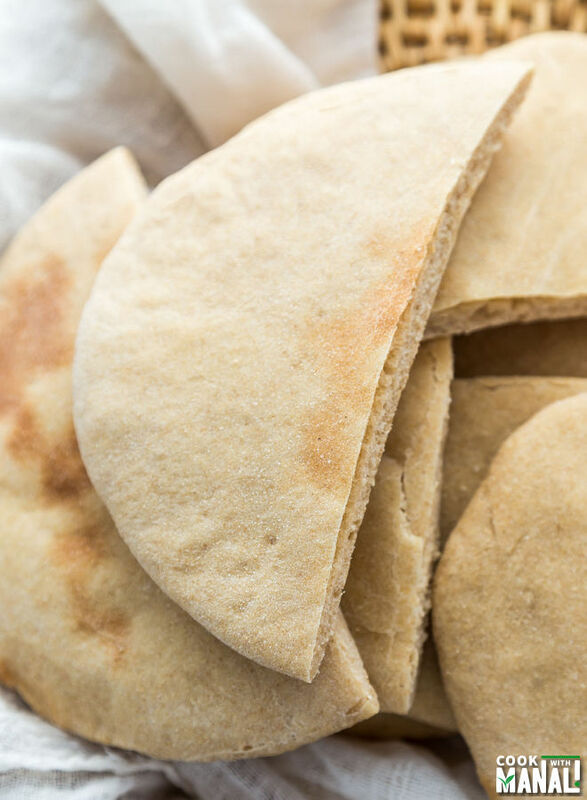 Healthy Pita Bread made with 100% Whole Wheat Flour! 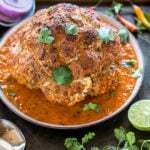 Recipe with Step by Step Pictures. Add in the olive oil and mix till it's well combined with the flour. Take warm water [110-115 F degrees] in a glass/mug, add sugar and yeast and give a quick stir. Let the mixture sit for 5-10 minutes. Sprinkle some flour on your working surface and knead the dough for 2-3 minutes till it's smooth. After 1 hour the dough will almost double in size. After 10 minutes, roll each dough ball into a round flat bread, around 8 inch and 1/4 inch thick. Sprinkle some cornmeal on a baking sheet and place the rolled pita breads over. Let them rest for 15 minutes, cover them loosely. Preheat your oven to 475 F degrees. I love pita bread and its never easily available in any local market here. Thank you for the recipe 🙂 I will give it a shot! Hi Sangita, did the yeast proof before you added the flour? That step is important. Pita bread does need a high temperature to puff up. Maybe your oven settings are off? I would get an oven thermometer and check the setting.